August is Movies Madness month, so we gave ourselves an impossible task to recommend (just) 5 must-see horror movies. Horror is the great un-sung movie genre, being what many feel is the most difficult to do well. Take away the jump scares, black cats, gratuitous gore and screaming teenagers and how many movies are actually frightening? What criteria should one have to determine such a list? Some horror films are terrifically original but don’t stand the test of time, while some are tried and true themes and still manage to scare the pants off us anyway. Most of the scare factor for a horror film comes down to what is terrifying on an individual basis. For example, a movie that almost made our list but missed out – The Descent. We will try not to give any spoilers because so many horror movies depend upon the surprise ending. The Descent was terrifying to watch for many because they either had claustrophobia issues, fear of falling, fear of darkness or the haunting worry of being lost – all of which are key elements to the shock factor of this film. Another film that we liked but didn’t make the list is John Cusack’s Identity. There is only one way to successfully see this film, that is to watch it with no other information available than the title. The less known about this twist-and-turn film, the better. A rare few will see the end coming unless some careless reviewer (not us) gives the big secret away. We could discuss cinematography, plot lines, cheese factors, the suspense of disbelief and how consistently the film maintains it’s imagined reality, but we’ll hold back. The Hunger gives everything away visually. Layered, rich, complex and at times even confounding, the audience finds themselves fully involved in a world familiar but out of control. Although The Hunger is #4 on our list, it is yours truly’s favorite movie of all time, so there’s considerable bias here. It captivates with Catherine Deneuve, Susan Sarandon and David Bowie as classy/punk vampires with Bauhaus, Delibes and Schubert sounds on the soundtrack. Like Angel Heart, the movie is not dependent on traditional, often hackneyed horror tropes, but still utilizes classic themes. The cinematography is stunning in both films and are well worth several viewings. The Lost Boys is a fun romp with rock-and-roll teen vampires. Kiefer Sutherland and hottie Jason Patric vie for the affections of Jamie Gertz while being tracked by the ‘Coreys’ – Feldman and Haim who provide some comic relief. This film was very much of it’s time and views like an extended music video, win win. The one and only. Jodie Foster battles wits with super-psycho Anthony Hopkins in this truly original and ground-breaking film. Silence of the Lambs took horror, mystery, psychological thriller and action cop genres and blended them perfectly. If you haven’t seen this movie – you must. A classic, The Exorcist has true staying power, terrifying audiences from the day it was released to present. The special effects are a bit dated but the theme of demonic possession has plenty of teeth. This film tapped into the cores of superstition, religion and human fears of the unknown. It doesn’t hurt that it follows a reportedly true account of a real exorcism, with only superficial changes and some Hollywood special effects added. The chill of this film stays with it’s audiences, playing on some of our deepest fears. We could easily have made a 50 Must See horror movie list but we figure this is enough to get you started and plenty to keep you sleeping with the lights on. For many of these films, we highly recommend purchasing them on DVD because they are well worth multiple viewings. 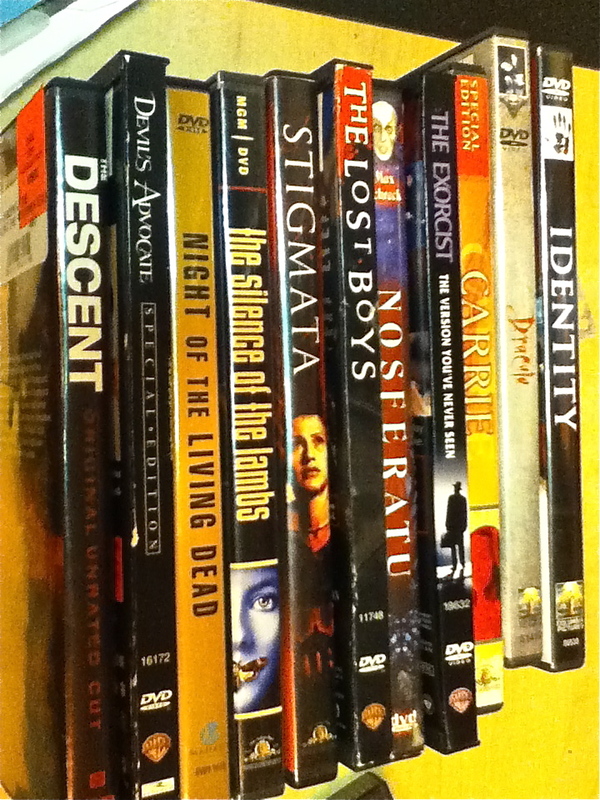 August is Movie Madness month at Bookmans, so grab a friend or two and stop by to pick up one of our Top 5 Horror Film recommends and don’t forget your Trade Credit. Jump scares are fine, but expensive movie dates are really scary!